Today was a windy day in northern Texas. We hit the road around 8:30 am and continued west towards Roswell, New Mexico. We fought bad winds for the first 2 hours of our trip but things abated nicely as we got further west. Phaeton Place handled the winds like a champ though….gotta love that tag axle! We visited Roswell earlier this year on our way back east and decided we didn’t need to stop there again. Our first stop was at Valley of Fires near Carrizozo, NM on US 380. A beautiful recreation area on the lava fields. They have 19 campsites available, some with electric and water. There is also a dump station. We enjoyed a nice hike around the lava fields path before pushing on to Socorro, NM where we spent the night at Walmart. We found out yesterday that our planned three day stay for a little bird photography at Bosque del Apache was a bust. Thanks to my poor planning, our visit coincided with the local crane festival, so lots of people visiting and campgrounds were full. Disappointing, but what can you do. The birds will always be at Bosque and we didn’t want to camp out at Walmart for 3 days. After a chilly night where temps dipped below freezing, we pushed on westward following Hwy 60 towards Arizona. A hasty plan B put together last night had us now staying at Countryside Encore RV Resort in Apache Junction for a few days. Our first stop was at the Very Large Array about 50 miles west of Socorro to check out the 27 huge antennae at the astronomical radio observatory. 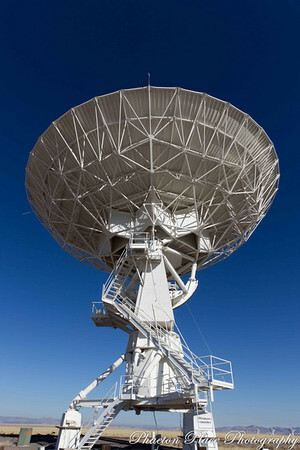 Some of you may remember seeing these antennae from the movie Contact with Jodie Foster. We were a little disappointed to see the visitor center was closed but we enjoyed the self guided walking tour none the less. 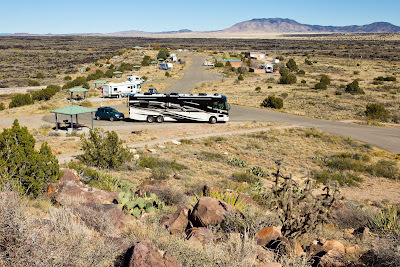 This entry was posted in Campgrounds, New Mexico, Photography.